We make our bread the traditional way, using stoneground flour, sea salt, water, a natural levain and the most important ingredient of all, time. This means our breads have lots of flavour, great texture and are better for you than many of the other breads you find in shops. Stoneground flour contains more of the wholewheat kernel, which the modern milling process takes out. This gives the bread more flavour and it leaves more nutrients in. Additionally, the traditional stone grinding is slower, so the wheat doesn’t heat up as it’s going through the milling process, again, preserving more of its flavour and nutrients. We use sea salt instead of table salt because it dissolves better in the bread making process, and has a cleaner taste. Although yeast is vital to the bread making process, it can sometimes overpower the flavour of the wheat, and in some people it can contribute to a stomach upset. We use our own sour dough starter in all of our breads, and a small amount of additional yeast in our baguettes and ciabatta. Most importantly we don’t use any sugar or fat to help our bread rise. Our breads are given time to ferment naturally. Time is a critical factor. A normal store-bought loaf can be made, start to finish, in about 3 hours; our bread takes around 24 hours. The extra time we give our breads allows all the flavours contained within the wheat to come out, something that’s almost impossible in 3 hours. We have something sweet, to suit anytime of day, depending on what you fancy. 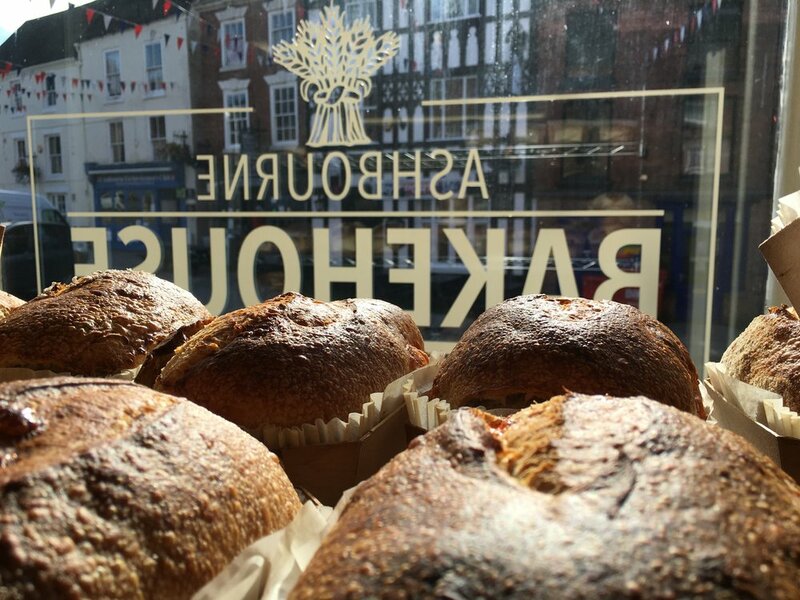 We have a whole range of sweet treats, including pastries, cakes and cookies, all made fresh in the Bakehouse every day. We use cane sugar to give a sweeter taste, free range eggs and fresh ingredients, not flavourings. Our vanilla essence is produced in-house, aged over several weeks to develop a rich deep flavour. Ready for something a little different this break or lunchtime? We have fresh bagels, made every morning, along with our own cream cheese spreads, that might just make you give up the lunchtime sandwich forever. We also have bread sticks, focaccia, Italian style pizzas and filled savoury swirls. All made by us, in the Bakehouse, fresh every day. We use Greek olives, marinated tomatoes, sun dried in Italy, fresh herbs, grilled artichoke hearts, goat's cheese and other delicacies for our savoury baked goods. If it's soup you want, we make a fresh soup Tuesday to Friday, and use our own breads to make delicious croutons to sprinkle over the top. We try to match the weather, so hearty, warming soups in the winter and lighter ones in the summer. We work hard to make sure we have amazing bread and baked goods, so we wanted to make sure we provided a great hot drink to go along with them. For the coffee lovers we partnered with a local coffee roasting company, The Longford Coffee Company to develop our own Bakehouse Blend. This is a filter coffee, blended from beans that come from a number of small farms in Central America. It has a smooth, medium body with hints of cherry, caramel and cocoa. For the tea drinkers we offer a tea made by Derbyshire based Northern Tea Merchants. This gourmet blend is lovely bright tea, made from Pekoe Fannings, a small leaf tea. If caffeine is off the menu or you prefer an herbal drink, then we also have peppermint tea on offer. Baking Courses take place throughout the year. They normally run on a Sunday starting at 10:00am and finishing at about 5:00pm. All current sates are sold out, however we hope to announce some extra dates soon, and new dates for 2020 will be published here in the autumn. Lunch – Focaccia you have made! Care and feeding of your own sourdough. Comfortable loose fitting clothes, short-sleeved shirt, non-slip shoes, (that can be wiped clean – lots of flour!). An apron will be provided.